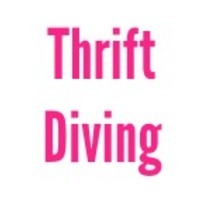 I'm Serena Appiah from Thrift Diving, a blog that inspires you to decorate, improve, and maintain your home on a DIY (do-it-yourself) budget! When we bought our outdated 1973 home in the winter of 2010, we spent every nickel and dime buying the house and had no money left over for decorating or repairs. I taught myself how to make over old thrift store furniture, but there were improvements, repairs, and projects I wanted to tackle that required me to learn to use power tools. Today, I absolutely LOVE power tools! There's no project I won't try at least once! On Thrift Diving, I walk you through, step-by-step (including video tutorials) on how to transform your home with thrift store finds, power tools, and creativity. My readers and I also do quarterly 30-Day Room Makeover Challenges where we transform one room in our houses at a time. What would I build? I would take on all of the small projects around the house that I keep having to ask my father in law to do, because I don't own a power saw! We've lived for 10 years in our house without baseboards on the second floor, so that would be my first project! I'm sure the 12" Ryobi sliding miter saw would help accomplish the job, no problem! I bet you could put a plastic liner where the bottles are and put ice in it to keep the drinks cold. Neat Idea! I might try this. Thanks for sharing! I would build an entryway bench with cubbies!! Of course with the hubbies help, but I think we could do it with that amazing saw!! Such a neat project.. What would I do? Add wainscoting in my kitchen. I would build a vintage headboard bench, and untold numbers of picture frames for all my unframed art. Great project. I would use the miter saw to finish all of the trim in my room addition, baseboards, window trim, chair rail. I also have some projects that would be much easier with sliding miter saw. Would love, love, love it! Best looking DIY drink holder I've seen! The snack compartment/tray is genius. Thanks for the inspiration. With a mitre saw, I'd build a sofa. Love it! If I had my very own miter saw, I'd make your awesome drink holder and finally be able to build all of my own canvases! I'll post pictures of mine once my wall mounted bottle opener comes in. I had to order it online. I didn't see any in the stores that I liked. Great piece. I love this table. I would love to learn how to do tile work. Love It and designing your own pattern on the tile! Awesome turn out! I'm going to have to do this soon!